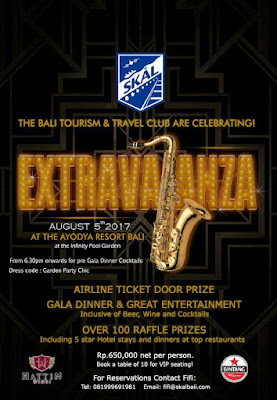 Widely considered the travel industry event of the year – the Skal Bali Ball 2017 “Extravaganza” will be held on Saturday, August 5, 2017 at the Infinity Pool Garden of the Ayodya Resort Bali. Traditionally a “sold out” affair – the 2017 Skal Bali Ball will feature top name entertainment; free flow beer, wine, and cocktails; a sumptuous menu; and over 100 raffle prizes to be given away. Tickets are available at a very affordable Rp. 650,000 per person. Purchases of tables of ten will receive VIP seating for the evening.